Months of research and sticky software vendor negotiations can make selecting an ERP solution a confusing and lengthy process. It’s not easy to identify the best enterprise resource planning (ERP) solution for your company’s needs from the many options on the market, and making a mistake can be extremely costly. 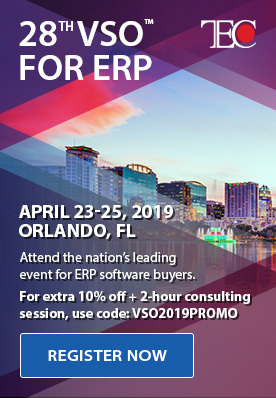 The VSO for ERP 2019 event brings together software selection experts and top ERP software vendors to help attendees simplify and fast-track the process. The VSO for ERP is the longest-running enterprise software evaluation, comparison, and selection event, hosting its 27th edition April 23-25, 2018, in Orlando, FL. Attendees benefit from comparing ERP software solutions head-to-head live and from learning best practices from TEC’s software selection experts. “This was a first-class show. Anyone shopping for a potential new ERP system should do themselves a favor and attend this event. The presentations were extremely informative and professionally delivered. The show has us second-guessing our original strategy for ERP selection and implementation. I highly recommend this show,” remarked a materials manager from a transport equipment manufacturer who attended a VSO event in the past year. You’ll have the opportunity to watch multiple, live product demos from top ERP software vendors. Each demo gives you ample time to evaluate the features and workflows of the product, assess its user interface and usability, and get answers to your specific questions about how the solution can meet your company’s unique needs. Moreover, each demo follows a script put together by TEC’s selection experts, so you can compare solutions on an equal playing field. TEC’s mission is to help companies evaluate and select the best software solution for their business needs—They’ve been doing this for 26 years now and are happy to be at the VSO event to share the winning strategies we’ve developed over the years. You’ll also learn about our decision support software—the foundation of our data-driven, best practices approach that lets you visualize and score every aspect of your software evaluation, resulting in a smarter, well-reasoned ERP selection. The post VSO for ERP 2019: The Must-Attend Event for Companies Seeking ERP Software appeared first on erpinnews.